iWindsurf Community :: View topic - Huge eddy creates southerly flow. Huge eddy creates southerly flow. Posted: Thu Aug 23, 2018 1:08 pm Post subject: Huge eddy creates southerly flow. In a pattern we have seen over and over this summer there is a huge eddy WNW of Bodega that is creating this southerly flow. This satellite image video for the last few hours clearly shows the eddy. Note the time stamp on the imagery. The unusual positioning of the North Pacific High that is responsible for so many eddies is also behind the Hurricane Lane track to Hawaii. Posted: Thu Aug 23, 2018 9:46 pm Post subject: Re: Huge eddy creates southerly flow. Mountain Bike Time! Good for your heart! Where to sail on S winds? Look at the Berkeley sensor. While it was 6.8 winds until 3:30, it bumped up to 5.5 winds until around 7Pm. The other spot would be Larkspur, where gusts of 16 is plenty for wound up 6.5 sailing for 160 lbs.ers. I will admit Pt. Isabelle fell asleep, but Hercules, Benicia, and Sherman are quite windy..not 30, but over 20. Then again, East Bay hates NW coastal winds..with the exception of Pt. Isabelle. 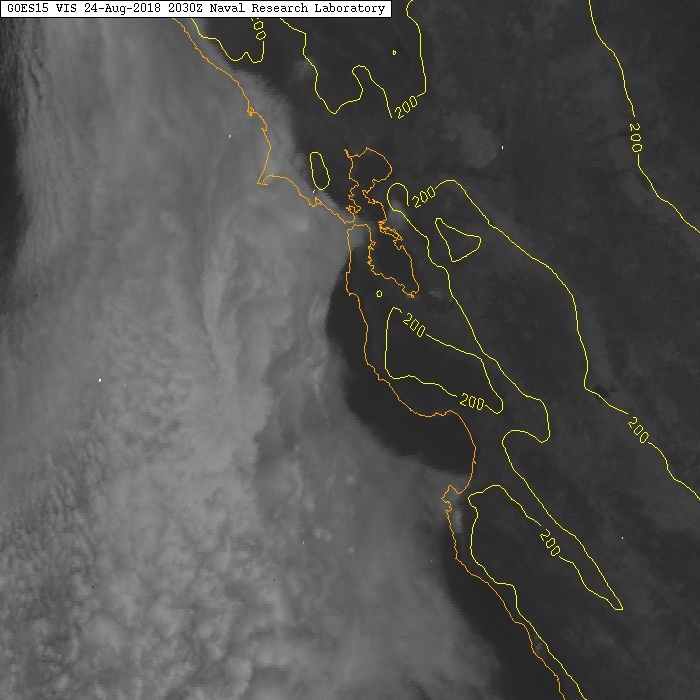 S Bay loves NW coastal winds. OK. Its nearly 2:00 on Friday 8/24/18. Top wind in Bay is 15 at Treasure. No wind on coast. Ditto Peninsula and East Bay. Saw the 11:30 update about Mr. Eddy and am now adjusting my plans. Took a look at the Sat photo and saw a fog pattern the likes of which I've never seen. WTF? BTW: Third was OK late last night. Just enough on my version of big gear. Actual wind, 6.0 at Larkspur, while Berkeley comes slowly up tp peak at 4. berk is not a high wind spot, so you might need your 6 meter sail and 90 liter board..unless you like eating and weigh 200 lbs. Too much reliance on sensors and forecast ... not windy in the Penisula? I was at Stick 8/24 and I had a great, if short, afternoon with 7.3 and Isonic 111. It started light, barely powered, and then it picked up to 7.3 very powered conditions with gust to 18-20 knots (thank you Loft switchblade, you can handle it!). Two people out, myself, and Robert with the foil and 7.8. He had to stop, overpowered, around 3 pm. The wind dropped at 4 pm, and it might have come back but I had to go. Bit too early to judge but today a likely replay: top wind speed around 14-18 knots at 3pm. I did'nt hit Berk until 5:30 , but it was about 15-21 since 4. Got planing with 6 and 111 until 6;15, but needed pumping. Corte Madera channel was gusting over 27, so Larkspur was the call. I got Switchblades 5.8 and 6.8, but still use SDM. the forecasts would get more accurate with time.